Sinus dilation is the process of opening up of the blocked sinus passages, enabling adequate drainage and airflow. Sinus dilation devices can be defined as systems employed in performing sinus dilation. Sinus dilation surgeries are minimally invasive procedures with long last ring effects. 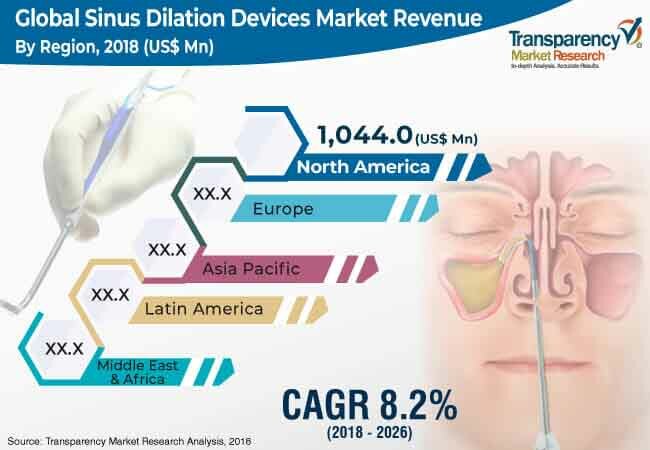 The global sinus dilation devices market was valued at US$ 2,021.4 in 2017 and is anticipated to expand at a CAGR of about 8.2% during the forecast period. Expansion of the market can be attributed to factors such as advantages offered by balloon sinus dilation devices, rise in prevalence of chronic sinusitis, for which surgery is the commonly preferred mode of treatment, strategic acquisitions by key market players, significant product launches, strong focus on research and development, favorable reimbursement scenario, and rise in demand for minimally invasive surgeries. However, a dearth of skilled specialists, strong preference of patients for medical therapy, which remains the first line of treatment for sinusitis, and risks associated with sinus surgeries are anticipated to hamper the market in the near future. In terms of product, the market has been segmented into balloon sinus dilation devices, sinus stents, endoscopy, FESS instruments, and others. The endoscopy segment has been further sub-segmented into sinuscopes and rhinoscopes. The balloon sinus dilation devices segment was a dominant segment in 2017 and is anticipated to remain dominant during the forecast period. However, the sinus stents segment is expected to expand at a high CAGR during the forecast period, owing to strong research in the development of drug eluting sinus stents. Based on procedure, the market has been classified into standalone and hybrid. The standalone procedures segment dominated the market in 2017 and is anticipated to remain dominant in the coming years. This segment is expected to expand at a high CAGR during the forecast period. The strong growth of the segment can be attributed to a rise in the number of standalone procedures being performed for the treatment of sinuses. The most widely performed standalone sinus procedures include FESS and balloon sinus ostial dilation procedures. In terms of patient type, the market has been classified into adult and pediatric. The adult segment dominated the market in 2017. It is expected to remain dominant in the near future. It is likely to expand at a high CAGR during the forecast period. The growth of the segment can be attributed to a rise in the geriatric population and the high prevalence of chronic sinusitis in adults. The prevalence of chronic sinusitis is expected to be around 17% of the total adult population in the U.S.. In terms of end-user, the market has been categorized into hospitals, ambulatory surgical centers, and ENT clinics. The hospitals segment dominated the market in 2017. It is expected to remain dominant during the forecast period. However, the ENT clinics segment is estimated to expand at a high CAGR during the forecast period. The high CAGR growth of the segment can be attributed to a paradigm shift toward surgeries performed in-office over surgeries performed in operation theatres. In terms of region, the market has been segmented into North America, Europe, Asia Pacific, Latin America, and Middle East & Africa. North America and Europe, cumulatively, accounted for over 75% market share in 2017. They are anticipated to remain dominant in terms of revenue during the forecast period. North America is expected to lead the market, owing to the presence of leading market players in the region, aiding in the easy and rapid availability of instruments and devices for performing sinus surgeries, and the strategic mergers and partnerships among players. The market in Asia Pacific is estimated to expand at a significant pace during the forecast period. Expansion of the market in the region is expected to be boosted by India and Japan. Moreover, a rise in the geriatric population, increase in pollution contributing to a rise in sinus infections, and increase in focus of market players on untapped market opportunities in the region are expected to augment the market in the region. Key companies operating in the global sinus dilation devices market include Medtronic plc, Smith & Nephew plc, Olympus Corporation, KARL STORZ SE & Co. KG, Acclarent, Inc. (Johnson & Johnson), Entellus Medical Inc. (Stryker), Intersect ENT, Inc., SinuSys Corporation, Meril Life Sciences Pvt. Ltd., and Dalent LLC. The global sinus dilation devices market report comprises an elaborate executive summary, which includes a snapshot that provides information about various segments of the market. It also provides information and data analysis of the global market with respect to the segments based on product, procedure, patient type, end-user, and region. A detailed qualitative analysis of drivers and restraints of the market and opportunities has been provided in the overview section. Additionally, the section comprises a competitive matrix and company profiles along with business overview to understand the competitive landscape in the market. This section of the report also provides market attractiveness analysis, by geography, thereby presenting a thorough analysis of the overall competitive scenario in the global sinus dilation devices market. In terms of product, the global sinus dilation devices market has been segmented into balloon sinus dilation devices, sinus stents, endoscopy, FESS instruments, and others. The endoscopy segment has been further categorized into sinuscopes and rhinoscopes. Additionally, the market has been segmented based on procedure and patient type. Based on end-user, the global sinus dilation devices market has been classified into hospitals, ambulatory surgical centers, and ENT clinics. The ENT clinics segment is anticipated to expand at a significant CAGR during the forecast period. The market has been analyzed based on price variations, technology trend, and presence of key players. The market size and forecast for each of these segments have been provided for the period from 2016 to 2026, along with their respective CAGRs for the forecast period from 2018 to 2026, considering 2017 as the base year. In terms of region, the global sinus dilation devices market has been segmented into five major regions: North America (the U.S. and Canada), Europe (the U.K., Germany, France, Spain, Italy, and Rest of Europe), Asia Pacific (China, India, Japan, Australia, and Rest of Asia Pacific), Latin America (Brazil, Mexico, and Rest of Latin America), and Middle East (South Africa, GCC Countries, Israel, and Rest of Middle East & Africa). The market size and forecast for each of these regions and the mentioned countries have been provided for the period from 2016 to 2026, along with their respective CAGRs for the forecast period from 2018 to 2026, considering 2017 as the base year. The research study also covers the competitive scenario in these regions. The report also profiles the major players in the market in terms of attributes such as company overview, financial overview, product portfolio, business strategies, and recent developments. Key companies profiled in the global sinus dilation devices market include Medtronic plc, Smith & Nephew plc, Olympus Corporation, KARL STORZ SE & Co. KG, Acclarent, Inc. (Johnson & Johnson), Entellus Medical Inc. (Stryker), Intersect ENT, Inc., SinuSys Corporation, Meril Life Sciences Pvt. Ltd., and Dalent LLC.